I love pampering myself with a body scrub. But then, the last time I had one at a spa was in 2010. I just can't find the time to have a body scrub session at my favorite day spa, With just an hour or two to spend for my kikayness, I normally choose to have a massage instead. Just recently, I was introduced to LeVon Magic Scrub. Judging from the packaging alone, it's like one of those body scrubs that you can buy in department stores. However, what's different is that you actually won't need water to apply it or to rinse after. With LeVon Magic Scrub, you can scrub conveniently anytime, anywhere. Actually, the boys and I have been using it for three weeks, scrubbing once a week. Yes, even Rap uses it but only to exfoliate his feet. What I normally do is to use this scrub on Saturday night, take a shower, moisturize, then go to sleep. My skin feels smoother and more supple in the morning. 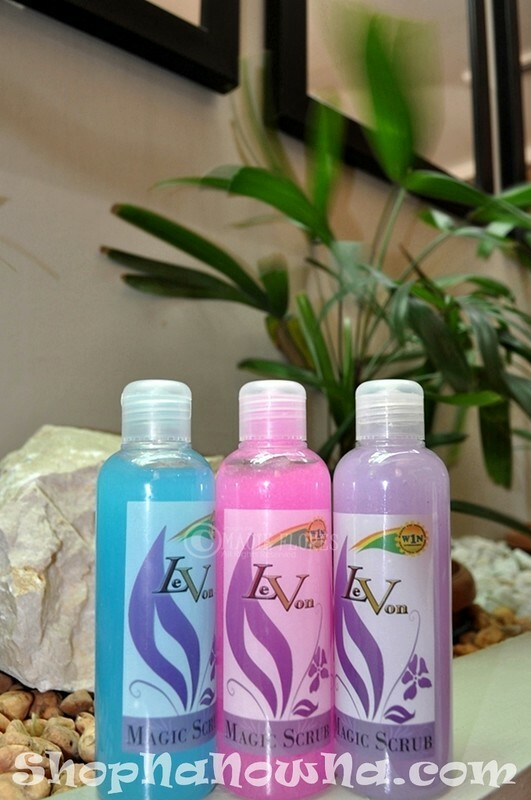 LeVon Magic Scrub's active ingredients include kojic extract, apricot seeds, and Vitamins A, C, and E. This 250ml bottle costs Php250 and you can buy this from any W1N direct seller. A bottle can already last for up to 2-3 months. I am also selling these scrubs (along with other products) in my online store, ShopNaNowNa.com. Looking for the best site for clearance scrubs? Uh-oh, you will have to ask Google for that! Not all dirt and dead skin cells can be removed by bathing alone, that's why I'm also using LeVon Magic scrub. It eliminates dead skin cells while also keeping the skin moisturized and evidently smoother and softer right after application! A no-rinse body scrub, that's interesting! This would be an ideal gift for family and friends this Christmas. How do you rinse it? or you just wipe it? Just wipe the libag away, hehehe... Pwede rin ligo ka after especially pag ginamit sa buong katawan.